Mary Louise Blondenia Scruggs Chapman, a native of Coffeeville and resident of Jackson, made her earthly transition April 4, 2019 at her home. 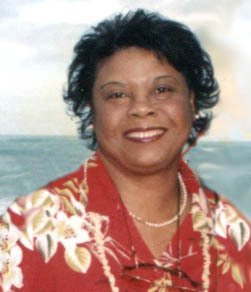 She was born to Louise Pugh Scruggs and Johnnie Scruggs Sr. on Feb. 24, 1951; she was 68 years of age. A graduate of Clarke County Training School in the Class of 1968, she relocated to New York, NY to attend nursing school. She received her nursing degree in 1983. She worked for Long Island Developmental Center in Melville, NY, and Long Island Red Cross until moving to Georgia in 1992, where she continued working for the Red Cross until her return to Clarke County, AL in 2001. On her return, she began working at Jackson Health Care in Jackson, AL. For a number of years, she worked as an LPN shift supervisor. In May of 2001, she married Henry C. Chapman. Mrs. Chapman was a faithful member of Berry’s Chapel A.M.E. Zion Church in the Winn community. She had served on the Deaconess and Steward Board, as the supply secretary of the Women Home & Overseas Missionary Society and Treasury, as well as on the Estimate Committee. Preceding her in death are her parents, Johnnie and Louise Scruggs; her brother, Johnnie Frank Scruggs; and stepmother, Mary L. Scruggs. Left to cherish her memories are her loving and devoted husband and caregiver, Henry C. Chapman of Jackson, AL; three stepchildren, Calvert Chapman of Madison, AL, Antonio Chapman of Jackson, AL and NaTasha Chapman of Birmingham, AL; three step-grandchildren, Jasmine Chapman, Jeremey Amir Donald and Addison Elise Chapman; three sisters, Christenia Scruggs and Dianne Scruggs, both of Coffeeville, AL, and Glory Osborne of Grove Hill, AL; stepsister, Guardine (Lester) Gibson of Ormond Beach, FL; two brothers, Jimmie (Pat) Scruggs of Baton Rouge, LA, and Jimmy Lee (Terry) Bumpers of Coffeeville, AL; three uncles, Eugene (Mary) Scruggs of Chicago, IL, Johnnie Thomas Scruggs and Joseph (Ida) Scruggs, both of Prichard, AL; three sisters-in-law, Paulette (Joe) Smith, Rose Marie Chapman and Gloria (Harvey) Player, all of Powder Springs, GA; two brothers-in-law, Harvis Chapman and Charles Chapman, both of Winn, AL; and a host of nieces, nephews, other relatives and friends.